I didn’t plant tomatoes this year, but oddly, last year’s plants came back on their own. This critter was the first one to ripen and it was so gnarly looking I had to paint it. I wonder why it turned up with this shape? Could it be 3 or 4 tomatoes that grew together like Siamese twins? Or did the tomato frame that supports the vines dent it? I started by doing a couple watercolor sketches to get an understanding of the shape. Then I made a gallant start on the oil sketch, getting it almost done but then fiddling with it until I had to scrape it all off, repainting and then fiddling some more. I must have scraped and fiddled and scraped 10 times. I called it done at midnight and went to bed. Tonight after work I gave it another shot, and am happier with this version (painted on top of the first). I can see that I wasn’t using enough paint the first time around. There are so many other colors than red in a tomato and mixing the right color for the right spot is surprisingly challenging. Next Post: Stop by the gallery opening…. Such fun to see a quirkily-shaped home-grown tomato when all you get in the supermarkets, and even the local market, are uniformly round baubles. 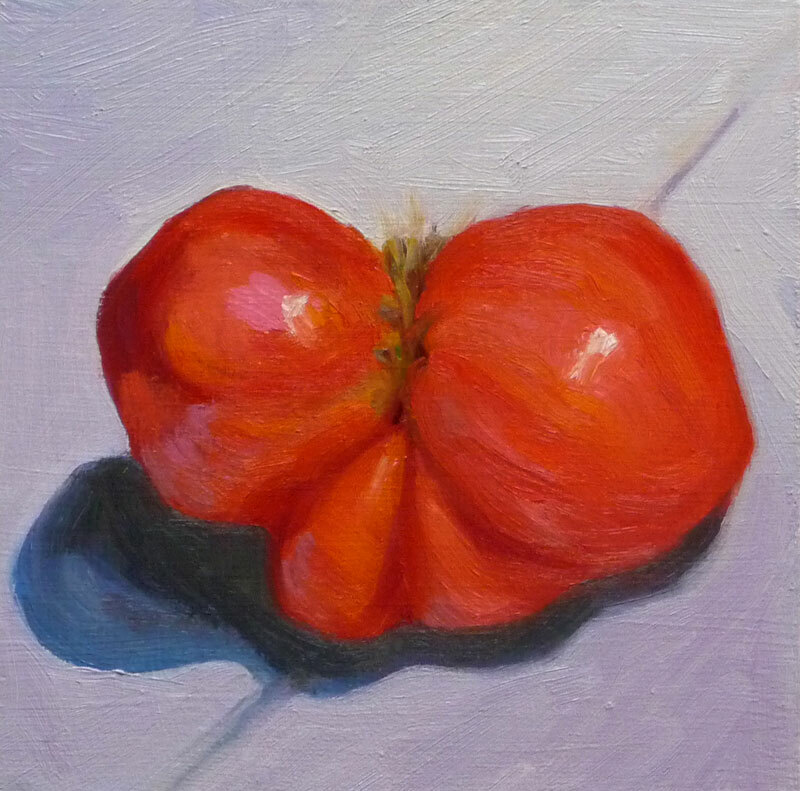 What a fab little subject – and you’ve painted it lusciously. It looks a little like a butterfly. Maybe it had greater ambitions than tomato-dom. Hey, is that my tomato? I’ve seen one just like this earlier this year. You’ve go a fab. job on this one Jana. The detail and the colors are right on. is this meant to be a tomato? !